Spinal disc pain terminology can become quite confusing if you go from one practitioner to another. Several terms are commonly used refer to the same type of spinal disc pathology. You may be told you have a bulging disc, herniated disc, pinched nerve, ruptured disc, disc protrusion, or one of several other descriptive terms. These words are referring more to the spinal anatomy used in radiographic findings than the actual medical diagnosis. It is important to correlate the radiographic results with a thorough medical evaluation to determine the precise source of the pain. For instance, in a bulging or herniated disc, the pain experienced is generally a result of the herniation pressing against a spinal nerve. The treatment options will depend on the extent of the pain and whether the patient wants to consider surgical intervention. 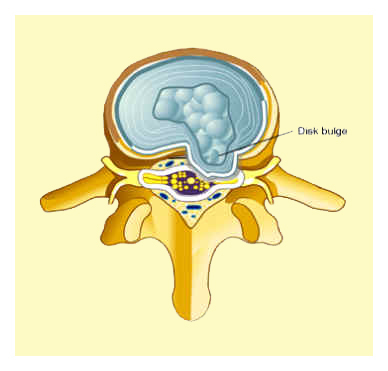 Conservative treatment is generally recommended for bulging disc pain. This includes rest followed by appropriate mobilization and activities, chiropractic or osteopathic manipulations, cold compression therapy, Blood Flow Stimulation Therapy™, physical therapy, and possibly an epidural steroid injection.